Do you know one of those meals that you just keep going back to, time and time again? The ones that don’t really require specific quantities, have amazing flavors and taste great no matter what? That’s this Mediterranean Quinoa Salad Bowl for me. Friends, add this bowl to your weekly rotation. Let’s have a build-a-bowl party. Split the ingredients in half and add to each quinoa bowl as desired. Spoon hummus on top and mix all the ingredients together if desired. Drizzle olive oil, and grind salt and black pepper over each quinoa bowl. Serve with a lime wedge to squeeze over olives, cheese, tomatoes and red onions. Enjoy! Create the meatballs by mixing the meat, all of the spices, and red onion together. Roll the meat into 1″ balls and place on skewers that have been soaked in water. Place each skewer on a lightly oiled baking pan. Broil at 500 degrees (keeping the oven door open about 2″) for 5-7 minutes, then rotate each skewer and continue broiling for another 5-7 minutes. Ensure that beef is fully cooked. While the meatballs are cooking, cook the quinoa according to directions. Slice the cucumbers, tomatoes, red onion, and avocado. 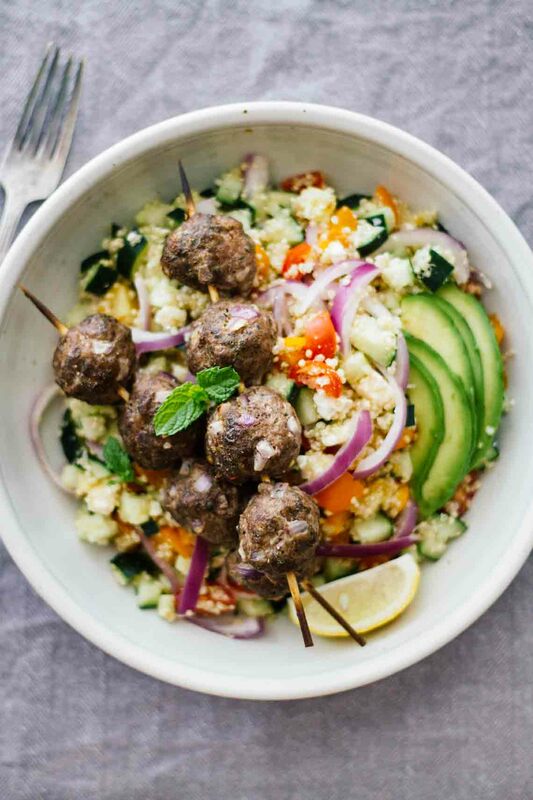 Toss the vegetables, quinoa, and feta together in a large bowl to create the salad. 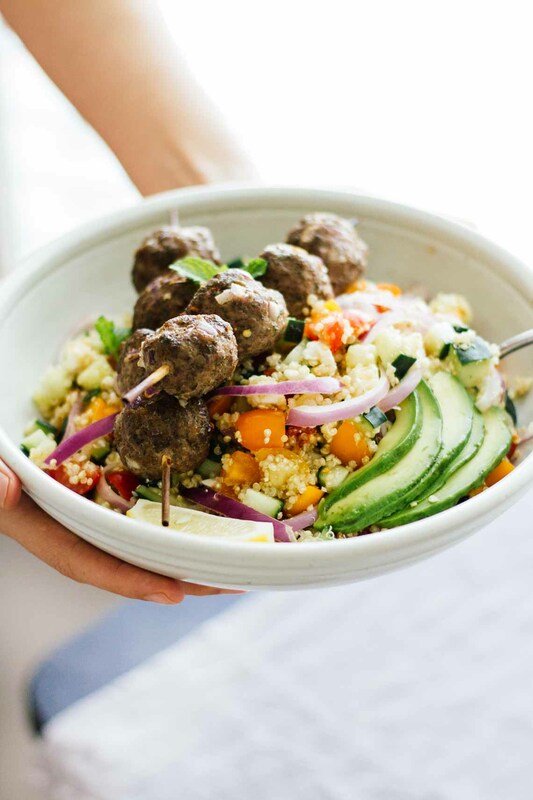 Serve each bowl by adding 1/4th of the salad and topping with meatballs. Enjoy! What is Get Dream Body App?